Nick grew up in a rural area of Chester County, Pennsylvania, where he developed a fascination with the landscape and colonial architecture found there. Through his paintings, Santoleri hopes to evoke a sense of nostalgia blended with his belief that the past must be permitted to intertwine with the present. Best known for the rich detail and realistic style of his watercolor paintings, Nick has broadened his creative vision through expanding his media and subject matter. The artist’s portfolio includes landscapes, still-life, and portraits in watercolor, oil, pencil, and pen and ink. 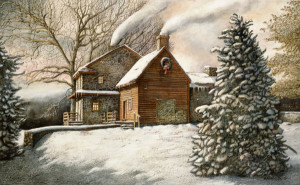 Nick is a member of the Philadelphia Sketch Club and continues to develop his artistic talent with classes at the Pennsylvania Academy of Fine Arts. Nick has established a national reputation through 30 years of publishing fine limited edition prints from his original paintings. Santoleri’s prints, and posters have been sold in over 500 galleries throughout North America and abroad. Nick has received numerous awards for his work, and has been commissioned by corporations, universities, non-profits, and individuals to create unique original artwork. Many of his paintings and drawings have been displayed and sold by well known galleries and art shows. Nick’s original watercolors and limited edition prints are included in the permanent collections of many corporations, government offices and educational institutions. This constantly expanding list includes: PNC Bank, Astra Zeneca, St. Joseph’s University, LaSalle University, Thomas Jefferson Hospital, Unisys, Double Tree, UPS, DuPont, and Philadelphia City Hall. Many of his paintings and drawings have been displayed and sold by well known galleries and art shows. In 1998 Santoleri was honored to be included in a very select group invited to the dedication of the Thoreau Institute in Concord, Mass., where he met President Clinton. To commemorate the event, he produced an oil portrait of the President which hangs in the Thoreau Institute. Since 1991, Santoleri has worked along with the Walden Woods Project using his limited edition prints to help raise funds to support their efforts to purchase and preserve the woodland surrounding Walden Pond made famous by Henry David Thoreau in his book Walden. To date, two Santoleri prints, depicting the historic and environmentally sensitive area around Walden Pond, have raised in excess of $100,000 for the organization. Don Henley, Grammy Award-Winning recording artist and founder of The Walden Woods Project, along with many illustrious celebrities, have cosigned these prints making them especially valuable as collectibles. Santoleri has also worked with the Salvation Army, the Ronald McDonald House, and a number of other charitable organizations employing his artwork for fundraising. Santoleri’s artwork was introduced to five continents through the efforts of the “We, The People 200 Committee” which organized the celebration of the 200th Anniversary of the signing of our nation’s Constitution. That organization chose Mr. Santoleri’s print, “We, The People,” to present to one hundred dignitaries, both national and foreign, who participated in the festivities. The National Preservation Committee of Valley Forge National Park has selected three of his prints to be sold through them at the historic site. Santoleri’s popular Philadelphia prints have been used on the sets of a number of movies and TV shows shot in the Philadelphia area. Over the years, Nicholas Santoleri has become an internationally recognized artist. The close work with the Walden Woods Project and its reach into the global environmental issues has brought Santoleri’s artwork worldwide attention. Several of his pieces have been published by a Japanese firm for exclusive distribution in Japan and the fine art publisher New York Graphic Society has published reproductions of Santoleri’s artwork for international distribution.